Paypal and credit cards accepted on our online store. Over 4000 items available. Read about the EM GirlsSySTEM Mentorship program sponsorship! Read about the EM Machine Mavericks Robotics team sponsorship. Read about the Sherbrooke University/Electro-Meters electric motorcycle sponsorship. The MSO5000 Series Oscilloscopes combine best in class sampling and memory depth with Rigol’s modern, flexible User Interface enabled by Rigol’s new UltraVision II architecture and innovative Phoenix Chipset. With 70 to 350 MHz models each with 2 or 4 analog channels, the MSO5000 Series brings innovative flexibility and capability to the engineer’s bench. Analyze your critical signals with zone triggering, 7 instruments in 1, Enhanced FFTs, color grading, and histograms all supported by the high sample rate, deep memory, and full memory measurements. The WT5000 Power Analyzer is the next generation in precision. With a modular design, a beautiful touch screen, and unmatched accuracy, the WT5000 is the obvious choice for your customer’s next power measurement platform. with 0.03% with vastly improved accuracy. See WT5000 video & contact EM! Rigol’s new 7000 Series Oscilloscopes combines best in class sampling and memory depth with our modern, flexible User Interface enabled by our new UltraVision II architecture and innovative Phoenix Chipset. With 100 to 500 MHz models each with 4 analog channels, the 7000 Series brings innovative analysis and visualization capabilities to embedded design, power analysis, serial decode, and RF applications. Analyze your critical signals with zone triggering, 6 instruments in one, Enhanced FFTs, color grading, and histograms all supported by the high sample rate, deep memory, and full memory measurements. 7000 Series Oscilloscopes provide unprecedented value and innovation in our mainstream embedded platform. See 7000 video & contact EM for demo! Engineers integrating WiFi, Bluetooth and other modern RF technologies are confronted with complex challenges like frequency hopping signals, channel conflict, and spectrum interference. Real-Time Spectrum Analyzers bring the dimension of time to RF Analysis making it easier to monitor and characterize these complex RF systems. Rigol’s new RSA3000 combines Real-Time performance (7.45µs 100% POI with 40 MHz RTBW option), rich data displays, and advanced triggering all at an exceptional price. See RSA3000 video & contact EM! Now, for a limited time, the best-selling Rigol DS1054z digital scope is available at a new even lower price . Also, Rigol currently offers a free bundle option including Serial Decode, Record Mode, Long Memory & Advanced Trigger on all DS/MSO1000Z models! And now – Introducing Rigol’s RSA5000 Series Real-Time Spectrum Analyzer! Four new models with frequency ranging from 3.2 GHz to 6.5 GHz. See RSA5000 video & contact EM! Read about Electro-Meters electric vehicle sponsorships. Watch our video – See what EM can do for you! Hoyt Panel Meters are now available on our store. Compatible with Yokogawa. Electro-Meters is proud to announce we now represent Fuji Electric’s line Gas Analyzers, Flow Meters, Pressure Transmitters and Recorders! Electro-Meters adds Preen Power to its extensive lineup! Electro-Meters now represents ITECH Power Testing Solutions! NOW! Order online with Paypal or credit card on our NEW! Microsite. Congratulations Accuenergy! Canada Revenue Approval Acurev1312! Yokogawa DL350 ScopeCoder. Maximum 8-CH high-speed isolated recording in a battery-operated compact chassis. Electro-Meters is a major distributor of Test and Measurement, portable instruments as well as Analog and Digital Panel meters. We have all your needs in Test & Measurement Instrumentation, Portable Instrumentation, Panel Meters and Signal Conditioners. For over 50 years we have provided service and support for products that are manufactured by the world’s leading suppliers. Whether you need technical assistance in selecting a product, need CSA approval, or are designing a turnkey solution, we are here to help. By teaming with our suppliers, we provide the level of support that you would expect from one of Canada’s leading organizations. Legally compliant, full warranty support, and cross-Canada support. See our Line Card. Analog and Digital Panel meters, Bargraphs, Industrial Controllers & Indicators, Shunts, Transformers and Transducers. Motor Testing Instruments, Transformers, Transformer testers, DC Loads and Power supplies. Portable instruments for the electrical field: Insulation testers, megohmmeters, Low resistance ohmmeters, DMMs, Earth testers, Clamp-on meters and Speed measurement instruments and much more! Don’t see what you’re looking for? Our goal is your satisfaction! If the product you are looking for is not available on our website, please contact our sales department: sales@electro-meters.com. We will be more than happy to assist you with your unique test and measurement requirements. Watch our video What EM can do for you! Register for Eptech shows here. Yokogawa Electric Corporation (TOKYO: 6841) announces that it has developed the next generation of precision power analyzers that offer exceptional measurement accuracy of ±0.03%. The WT5000 combines accuracy with stability, noise immunity and flexibility to meet the measurement needs of those who develop energy-efficient systems. In the rapidly evolving industry sectors of electric vehicles, renewable energy, and energy efficient technologies, the need for reliability in testing to enhance safety, efficiency and performance has never been greater. In the WT5000 Precision Power Analyzer, engineers have a versatile platform that delivers both reliable measurements for today’s needs and is flexible to meet the needs of tomorrow. Yokogawa developed the WT5000 Precision Power Analyzer to help satisfy evolving application requirements and ever-changing international standards that call for custom measurements and consistent accuracy. Exceptional measurement accuracy: The WT5000 achieves the world’s highest measuring accuracy: ±0.03% at 50/60 Hz, allowing precision evaluation of power consumption, loss, and efficiency of electrical and electronic devices. The wide dynamic current range of the WT5000 is indispensable for testing energy-saving designs. One of the essential elements for determining the performance of a power measuring instrument is the A/D converter that performs analog-to-digital conversion. In order to obtain the world’s highest measurement accuracy, the WT5000 uses an 18-bit converter with a sampling frequency of 10 MS/s. This allows for precise capture of waveforms from the latest high-speed inverter devices while producing a stable measurement. Up to 7 Input Channel Modular Flexibility: While the WT5000 has the same dimensions as existing models in Yokogawa’s WT series, it incorporates up to seven input channels, supporting applications that previously would have required synchronization of 2 multiple instruments. As a result, it offers considerable savings in installation space, communications overheads, and cost-effectiveness. Further benefits result from the use of plug-in modular input elements, which can be swapped directly by the user. The 30 A and 5 A elements can be switched for applications involving electric vehicles or fuel-cell vehicles, where developers are increasingly required to evaluate a number of different motors. Using the WT5000 equipped with the /MTR1 and /MTR2 options, it is possible to evaluate up to four motors simultaneously with one unit. These options support A, B, Z position signals from encoders as well as analog or pulse type signals from torque meters. Harmonic measurements for multi-phase systems is greatly enhanced due to the 7 element input design. Simultaneous dual harmonic analysis can be performed up to the 500th order and up to a 300 kHz fundamental waveform. This enables measurement of the fundamental frequency from the rotational speed of the motor, while also checking the influence of the switching frequency from inverter drive. External sensor input function is fitted as standard: An external current sensor input function is fitted as standard in the input element of both the 30 A and 5 A input elements of the WT5000 in order to meet the needs of an increasing number of applications that require the evaluation of larger-current devices, such as electric vehicles and large-scale solar installations. For much higher currents (up to 2000A RMS) dedicated high-current sensors are available. Yokogawa AC/DC CT series sensors are current output in order to minimize the influence of noise, the 5A input element is well suited for use with these current sensors. Applications: Manufacturing testing and inspection, in addition to research and development of products requiring high precision power testing. Applications involving electric vehicles or fuel-cell vehicles, where developers are increasingly required to evaluate a number of different motors. The WT5000 Precision Power Analyzer precisely tests and evaluates power output and loss with consistency and accuracy. This power analyzer accommodates a variety of plug-in options to streamline efficiency and 3 reduce or eliminate the need for multiple devices in the power testing phase. Users have the flexibility to utilize the features of the WT5000 specific to their application, increasing efficiency and providing cost savings while producing extremely accurate results. The DS2000E is available and shipping now. Please contact RIGOL or any authorized partner for information. Yokogawa Introduces Release 4 of the SMARTDAC+® GX/GP Series Paperless Recorders and GM Series Data Acquisition System. Yokogawa Electric Corporation (TOKYO:6841) announces that it will introduce release 4 of the SMARTDAC+® GX series panel-mount type paperless recorder, GP series portable paperless recorder, and GM series data acquisition system on May 19. RIGOL Technologies, Inc. announces an expansion of their Waveform Generator Portfolio. The new DG1022Z gives budget constrained customers an uncompromised solution with advanced features typically reserved for much higher price points. Now Makers, Educators, and IoT designers working with both electrical and RF applications can build long complex arbitrary waves, generate 8th order harmonics, create advanced modulations and inject random noise. The DG1022Z extends the DG1000Z portfolio to 3 models (25, 30, and 60MHz) providing the same unprecedented value at each point. A dedicated process calibrator which is capable in performing a control loop check and inspection of devices. It has three times higher accuracy of ±0.015% rdg. * to source and measure mA and voltage. It can be used under HART or BRAIN communication with 250 ohm resistance embedded. New UT55A, UT52A, UT35A, and UT32A DIN rail mounting type controllers are now available. They all comply with the global DIN standard and thus can be easily mounted in panel boxes. June 30, 2014 Chroma – New 62020H-150S 150V/40A/2kW Programmable DC Power Supply with Solar Array Simulation is an addition to Chroma’s line of programmable DC power supplies designed specifically for PV inverter testing. June 4, 2014 New Spectrum Analyzers up to 7.5 GHz from Rigol. 2 new high-performance, high frequency spectrum analyzers built on the extremely popular DSA800 series platform. 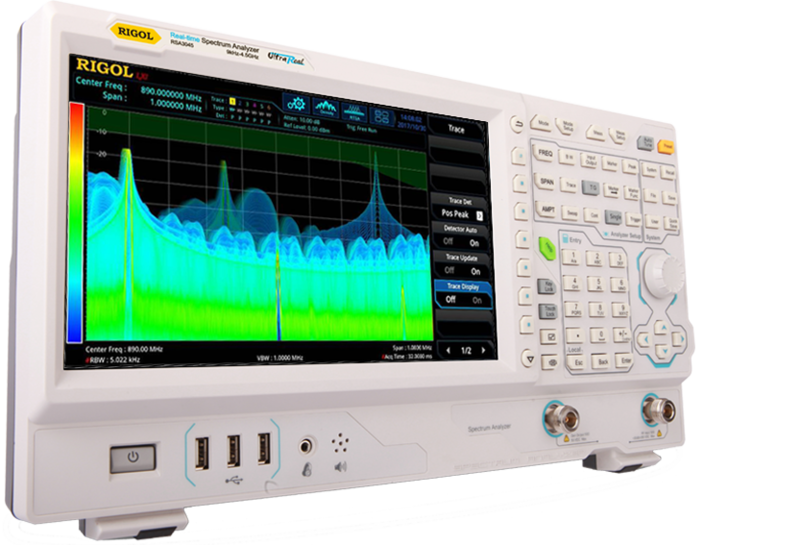 The DSA832 and DSA875 expand the DSA800 series spectrum analyzer family to 3.2 and 7.5 GHz respectively. April 2, 2014 Rigol Technologies Inc. announces their newest product category with the M300 Data Acquisition System. Integrating Rigol’s 6.5 digit DMM technology into a robust and versatile system mainframe with modules enabling applications from multichannel scanning to switching and control. The M300 mainframe can hold up to 5 modules and up to 320 switch points. 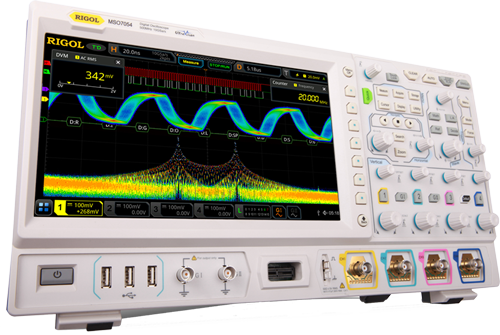 January 27, 2014 Rigol Technologies, Inc. introduces the DG1000Z series Waveform Generators, adding to its extensive portfolio of feature rich test and measurement equipment.